Strong lotus hardwood hangers, with a rich, smooth, mahogany finish that will add sophistication to any wardrobe. The integrated inlaid, non-slip grip on the trouser bar prevents clothes from falling on the wardrobe floor and collecting dirt and dust. A slight wishbone design, contoured neck, and broad shoulders not only allow for better presentation of garments, but they aid in providing vital support to your clothes in all the right places. Providing your clothes with the correct support can stop seams and stitching from deteriorating, therefore prolonging the life of your garments. The chromed steel swivel hook has a modern look and allows hangers to be positioned any way you choose. 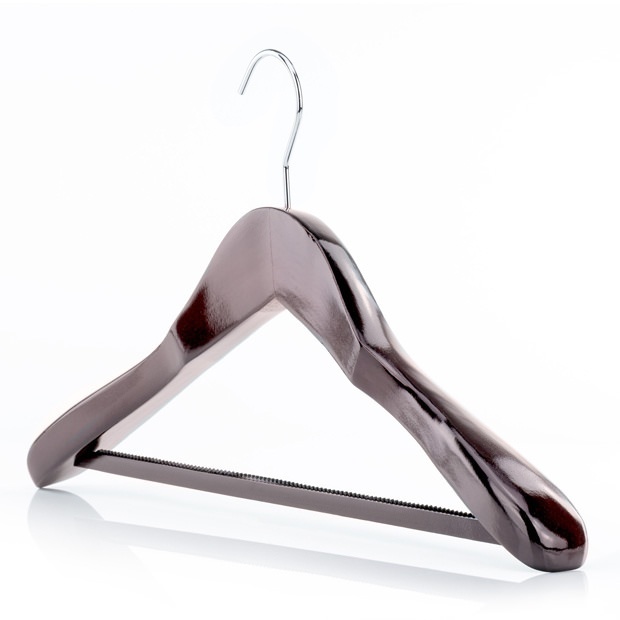 Although additional support benefits any garment, these hangers are most beneficial for heavier weight clothing, and items where a fuller shape is more important such as jumpers, jackets, coats & suits. Made from strong lotus wood. Slight wishbone design, contoured neck & broad shoulders. Chromed 360° metal swivel hook.